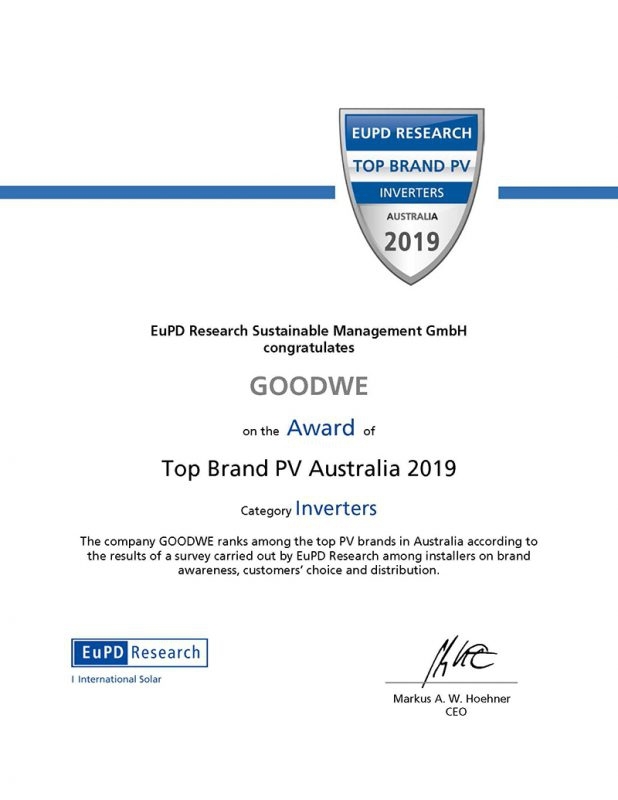 GoodWe has been awarded the 2019 Top Brand PV seal for Australian Market, as announced by independent market research specialist EuPD Research. Based on 15 years of research, the prestigious Top Brand PV seal is awarded based on EuPD Research installer survey, which analyzes brand perception, customer’s preferred choice and distribution in global markets, in order to identify the inverter brand which distinguishes itself from the rest in the perception of their customers. Last year, GoodWe supplied 23% of residential market share in Australia, which is about 180MW, ranked No. 1 among Chinese brands. Winning this seal approval confirms the GoodWe brand is in a leading position of Australian PV market and is recommended by local professional installers and retailers, able to identify the inverter brand which distinguishes itself from the rest in the perception of their customers. “We are very proud of this award. Australia is one of the most important solar markets which is set to exceed 5 GW of newly installed capacity in 2019. With 7-year experience in AU market and a dedicated local technical support team, GoodWe is in a privileged position to better meet customers’ demands and increase its growing market share.” stated Huang Min, CEO of GoodWe. Thanks to reliable performance of GoodWe inverters during the past years, GoodWe brand image has been well recognized by customers and business partner worldwide. 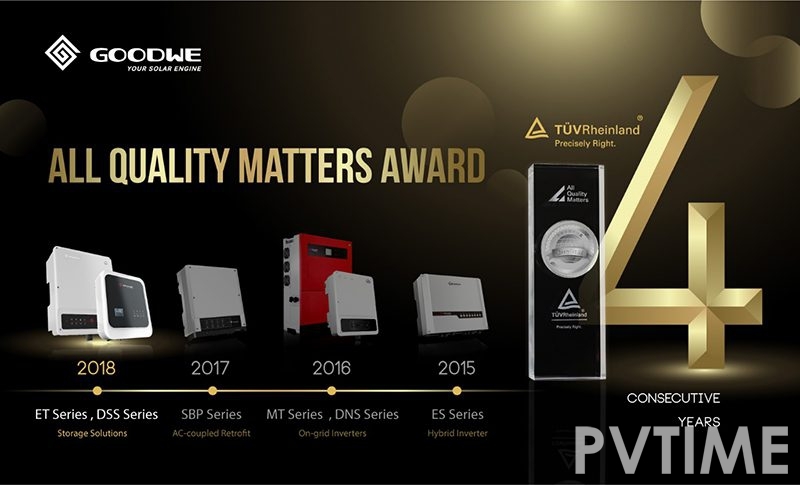 TÜV Rheinland, the great provider of technical services worldwide, also awarded GoodWe as the winner of “All Quality Matters Award” for 4 consecutive years, for both its outstanding on-grid and storage solutions. “With the objective and credible evaluation procedures and authoritative and neutral evaluation bodies, GoodWe is expecting great improvements and more contributions to the whole industry.” said Huang Min. The benefits of these awards increase credibility and create trust among end customers and business partners. Thanks to the reliable operation and excellent performance, highly approved and certified GoodWe products provide global investors and developers with long-term benefits and a faster ROI. GoodWe’s philosophy is to always create win-win partnerships with customers.